and takes pride in being part of the Danish tradition of offering exercise and sports to men and women of all age groups. Members and teams from BAC take part in training, national meetings, tournaments, and running events. Now and then, the most talented and dedicated individuals and teams qualify for international meetings. 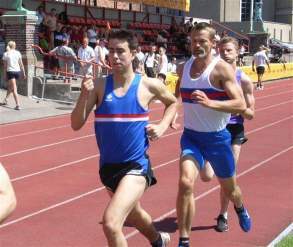 In 2011, BAC got their first participant in the World Championships, when Andreas Bube advanced to the semi finals on the 800 m distance in Daegu, South Korea. And the junior women's team has been to the European Cross Country Championships two years in a row. Most of the time, it's about the training, though. You will find options for different kinds of training. Children and young people have groups for different ages, and long distance runners have groups for different running levels. Please refer to the list of training groups . . . even though it's in Danish. If you want to become a member of Bagsværd Atletik Club, you can call or mail one of the trainers for details. Well, it's even easier if what you want is long distance running. Then, just show up, ready to run on Tuesdays at 17 o'clock. You must excuse us for having only this introduction in English. All work in the club, including the web site, is done by unpaid volunteers, and it's impossible for us to do more than we already do. And, believe it or not, we prefer to go to the club and meet with the others, and do some running. We hope you're still interested in Bagsværd Atletik Club. And maybe, we'll see you.